It was a powerful, magnificent and in all means wonderful experience we were part of together with my soul sister and friend Emoke, on Sunday night, August the 9th. The event, the thunderstorm started at 8:21pm in the energy of 11 and ended with the sacred number of 7 exactly 142 minutes later in the energy of 8 at 10:43pm. At 8:20pm I have called up my dear soul sister and friend Emoke and settled down on the balcony watching the warm early August evening. Our conversation started with her question: “Do you see that black, dirty, dreadful cloud in the sky?” I haven’t seen anything at that moment, however, the next instant I noticed that suddenly pitch-black, filthy, the most ominous storm clouds I have ever seen were furiously covering the sky. I had just time enough, to say Jesus and to rush into the room. In seconds the storm broke loose. Huge thunderbolts, in never seen forms and patterns were flashing through the sky from east to west, than from west to east and on south in the shape of gigantic trees down to Earth; creating daylight in the pitch-dark evening. 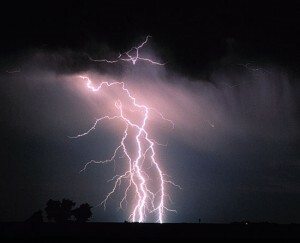 The blazing of each thunderbolt lasted for minutes, but only here and there was some thunder or roar. It was a splendid sight, powerful, amazing! With the phone in our hands both of us were sitting in front of our balcony doors and were fascinated by this magical but amazingly forceful event in the sky. In meanwhile the ever cleansing, puring rain started, washing away everything impure and we were talking about that due to 24 hour world meditation and connecting to the Christ Consciousness Grid on 8:8:8, the cleansing of Mother Earth and all her children came with such a great force and spectacle. The gigantic thunderbolts, in nuances of silvery gold, pink and violet tore the sky across-in circle-far and wide; but thundering came every now and then only. Both of us were enjoying and fascinated by this unusual miracle in the skies. And then came the realization deep in ourselves that due to connection to the Christ Consciousness Grid, the final battle of the Dark and the Light has begun. This is not a summer storm, this is a COMBAT IN THE SKIES AND ALL OF US, IN OUR I AM THAT I AM DIVINE PRESENCE ARE THERE, FIGHTING THE DARK FORCES IN LIGHT LEGIONS OF ARCHANGEL MICHAEL. After couple of minutes occurred, that the rational mind understood what we were talking about. Astonished waves of realization went through our beings, leaving us in goosebumps, happy and without words. In that moment appeared to me that our Divine Guide Archangel Michael is smiling at me in a glittering shine, confirming that we have got it right! A bit later once again flared up the sparkle of our guide Archangel Michael and after that the shine of the Legion of Light. Then it was over, and the gleaming of the lightnings were distant beyond the horizon. White shreds of clouds were hanging in the night and a thought filled my whole being that the shattered army of the DARK clouds trudged through the sky. Emoke, soul sister and friend of mine, in her dreams received the confirmation of virtuality of these events. And once again, here and now my thanks to the Universe that we could be part of this miraculous event and my thanks to Emoke that we could experience together in oneness the miracle.